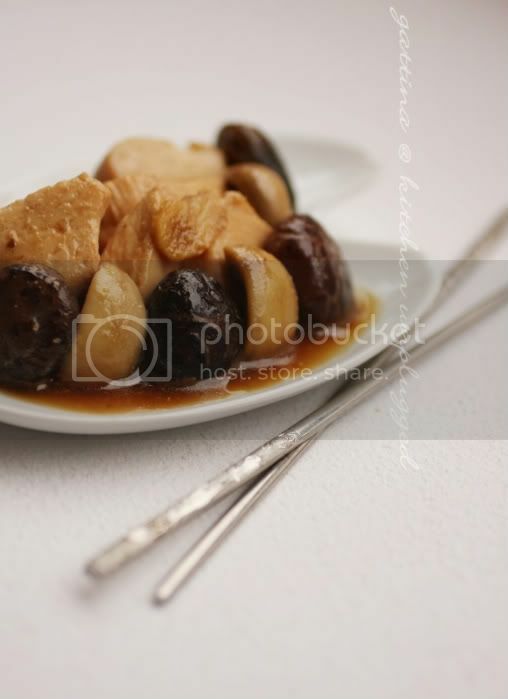 Another staple dish in overseas Chinese/Japanese restaurants, no one can resist its beautiful light taste and a hint of aroma from wine and ginger. This dish should be modified from something original, be it teriyaki this cooking technique or the seasonings used in teriyaki, for me I primarily care if it tastes good or not. Obviously the Asian immigrants did a wonderful job! Allow me to trail away and talk about a dog breed... 'Tong' dogs (or back translation Chinese dog). They are the most common mix-bred in Hongkong. It is just impossible to trace the origin as their ancestors were already mega-mixed, some look like miniature German Sherpard though. We had one and he was black. And it's easy to spot another 5 of these blackies wandering in a street because they didn't see as valueable breed and so got abandoned. Ironically, our dog had attracted countless people in the States, one guy even requested a puppy of him. Classic is good, but sometimes, good is simply good, regardless. Soak the dried Shitaki mushroom in lukewarm water for a few hours, soften. Place them in a pot and fill up with water, bring to boil, then simmer for 30 minutes. Drain, and squeeze out the water of the mushroom. 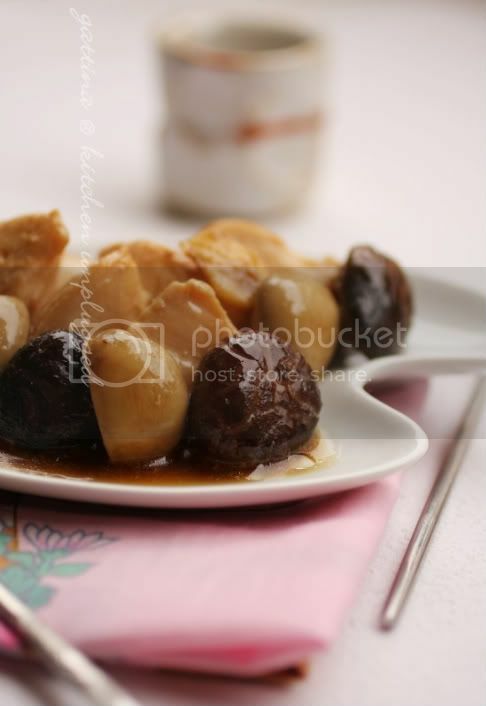 Cut the chicken to 3cm x 2 cm chunks, marinate with soy sauce, white wine and sugar for 30 minutes. In a skillet drizzle some oil, saute the shitaki mushroom with a slice of ginger for 2 minute over medium-low heat, then add button mushroom and continue cooking for another minute. Raise the heat to medium, stir in chicken and dash in a bit of white wine, keep stir until the meat are evenly brown. Now add the sauce and another slice of ginger, continue cooking for a few minutes over medium-low heat until the meat is done. Taste and season. Two dishes in a day, I can't beta you Gattina. I really agree sometimes things at its simplest taste the best! Never heard of the Tong dog though. Interesting! A tasty dish! This looks good! Wow Gattina you are a cooking whirling dervish! You have been cooking up a storm of delicious delights. I like that you were wondering what the heck the Spaniards were cooking all day- in your language class. Then answer should definitely be...Chinese Food! Interesting about the Tong dog. I tried to google it to see a photo but couldn't find one. P.S. Oh! Did you follow the 12 grapes tradition on New Year's in Spain? This is great with rice! This sounds great! So simple but so delicious. I'll be making this the next time I actually have wine in my kitchen - I know my boyfriend would love it!